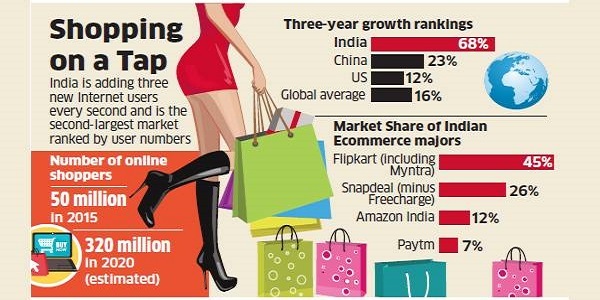 Being driven by a young demographic profile, increasing internet penetration and relative better economic performance, India’s e-Commerce revenue is expected to jump from $30 billion in 2016 to $120 billion in 2020, growing at an annual rate of 51%, the highest in the world, according to a joint ASSOCHAM-Forrester study paper. Interestingly, about 75% of online users are in the age group of 15-34 years since India is one of the youngest demography globally. “This is expected to be a continuing trend in coming years, given the age distribution in India”, said D S Rawat, ASSOCHAM Secretary General. It is not surprising to see the growth among categories focused on younger audiences in the last 12 months, added the paper. The maximum online shoppers are from the 15-24 years of age group, comprising both of males and females. In India roughly 60-65 per cent of the total e-commerce sales are being generated by mobile devices and tablets. Shopping online through smart phones is proving to be a game changer, and industry leaders believe that m-commerce could contribute up to 70 per cent of their e-commerce revenues. [su_box title=”More From DSIM” box_color=”#c7c7c7″ title_color=”#000000″ radius=”5″]1) STARTUP: How Truejodi is filling the loophole in the matrimonial sites?